There are three meanings inherent in "return to paintings" in the art scene between the middle of 1970s and beginning of 1980s. First is the return to paintings and sculptures due to changes in tendencies of the reductionist artists. The path that Lee U-Fan and Yoshida Katsuro took can be called return to paintings and the paths that Koshimizu Susumu and Sekine Nobuo took can be called return to sculptures. Because paintings and sculptures seemed like a conservative reaction around the 1970s, it can be said that they have taken on the role of the Neo-Classicists*4e1. Some of the artists from Bikyoto, Post-conceptualists and Post Mono-ha followed the same path later and went back to doing paintings and sculptures. Takubo Kyoji started to do decorative sculptures, while Shimizu Seiichi and Takamizawa Fumio came to doing colorful paintings. Former Hi-red Center member Nakanishi Natsuyuki also moved on to becoming a painter during this time. Second is the trend in which the latent longing for paintings played a part in creating diversity. Artists such as Tatsuno Toeko, who started out with systemic paintings, as well as Nakagami Kiyoshi and Suwa Naoki gained attention. 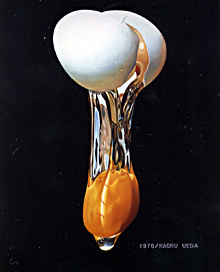 Usami Keiji, who advocated "reinstatement of the act of painting," as well as Ueda Kaoru, who is associated with the once popular Super-Realism, will also be mentioned here*4e2. During this time, Yamada Masaaki and Kuwayama Tadaaki, who created works which seemed to question paintings themselves since the 1950s, also gained attention, helped by the criticism of Fujieda Akio. The content was an American style formalism which argued for the return to paintings and not reductionism in the style of "Between Man and Matter" exhibition which claimed that even paintings and sculptures can be renounced. The first and second both had commonality in which there was a tendency to produce works as an engagement of some type of system. In the actual works, Lee's "From Point" and "From Line" took the lead, but in the theoretical sense, there was probably a praise for Bikyoto's praxis (activity) in the background. There might even have been an awareness of the American minimalist paintings. The third is a big undulation different in nature from the preceding two, which was a trend in "bad" Western representational paintings of the early 1980s, a movement in response to "Neo-Expressionism." The asceticism which remained in the preceding two were completely eliminated, and was called "reinstatement of paintings." This subject will be touched upon in the next chapter. 【和文改変・英文初版ママ】The "Neo-Classicism" mentioned here refers to those who initially took a radical stance against tradition like Picasso and the composer Stravinsky, but went back to traditional ways. This sort of act can be seen often during the era of diversity. See *7c14. 【和文前半少々改変＋後半新規事項追加、英文初版ママ】The photorealistic Super-Realism took both the world of art and design by storm during the mid-1970s. The significance of this trend in the context of art was the fact that it inherited the nature of reproduction and eradication of individuality which the Post Conceptualists showed interest in, or the question of suspicion towards visual sensation as can be seen in Trick Art. One can not deny that the longing for paintings could also have been a latent factor for this trend as well. There was also a side where Super-Realism, which became very popular in the United States, was imported to Japan. During this time, artists engaged in graphical pop art such as Yokoo Tadanori, Uno Akira and Sawako Goda strengthened their super-realism in their works. See *5c3. - Tatsuno Toeko's earlier works involved using stripes on silk screens. 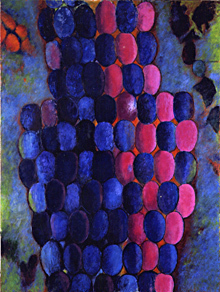 She later moved on to painting with hands, moving away from minimalistic qualities and created colorful painterly works. - Suwa Naoki's color processing has been consistent from his earlier systematic consecutive planar works and is very Japanese. The use of byobu (folding screens) and kakejiku (hanging scroll) since the 1980s was seen as a criticism towards Western-style painting[20090125ここ直すべし]. Despite being a painter, he is also sometimes categorized as being in the Post Mono-ha. - Until Fujieda Akio discovered him, Yamada Masaaki stated that he "painted with the supposition of if there was such a thing as a painting" for quarter of a century as an unknown artist. 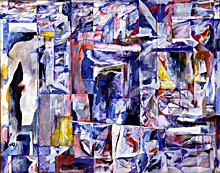 The transition from still life painting to abstract painting was like that of Piet Mondrian, and he moved on to doing works with stripes in the 1960s, and moved on to covering up the canvas surfaces with a single color in the 1990s. 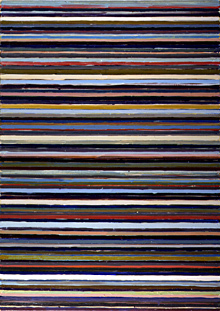 - Kuwayama Tadaaki moved to the U.S. in 1958 and started to produce untitled rectangular color surfaces. He stated that "there is only art itself" regarding his works. - After producing earlier works in Art Informel style, Usami Keiji moved on to producing works which systematically composed silhouettes of human bodies. He also produced technology art using lasers for Expo-Art and wrote a book on painting theory. - Ueda Kaoru enlarged small objects using hundreds of photographs and achieved a realism more realistic than photographs.